Aid agencies are restoring food supplies to two refugee camps in Chad after operations were suspended for several days because of violence. Relief teams returned to the camps, home to more than 40,000 Sudanese refugees, after camp leaders guaranteed their safety. Another 5,000 people are outside one of the camps, currently without food. 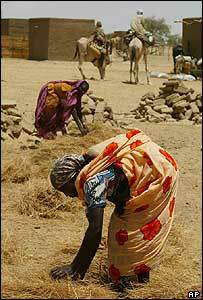 The refugees are among more than one million people who have fled the conflict in Sudan's Darfur region. On Sunday, the UK aid agency Oxfam sent a plane carrying 30 tons of water and sanitation equipment to Darfur, in the west of the country. Meanwhile a Sudanese rebel leader has said his group will not talk to Sudan's government until it disarms Arab militias suspected of killings in Darfur. Khalil Ibrahim, leader of the rebel Justice and Equality Movement, has accused the government of arming the pro-government Janjaweed. Peace talks hosted by the Africa Union were suspended last week when rebels groups walked out, blaming the collapse on the government for refusing to meet their conditions. There have been no reports of violence since aid workers returned to Chad's Farchana and Bredjing camps on Saturday. Relief work was suspended on Tuesday after two aid workers were injured when they were attacked with stones. Trouble escalated when the Chadian army moved and soldiers opened fire, killing an alleged ringleader of the violence and a woman refugee who was standing behind him. Aid workers agreed to return to the camps after authorities and refugee representatives assured them it was safe to do so. But the BBC's Andrew Simmons, who has been to the camps, says there are fears that some of the small groups of young men who incited the disturbances have not been found. He says whether the violence was politically motivated is uncertain, but Chadian authorities fear the involvement of Arab militia from Sudan. Altogether, camps in Chad provide shelter for an estimated 120,000 Sudanese refugees. The relief agencies are struggling to provide shelter, food, water and medical treatment. Our correspondent says the supply lines have improved because of a let-up in the heavy rains which turned sand tracks into quagmires and can cut off some of the camps within a few hours. While there is some improvement now, he says, the relief agencies warn that next month will see prolonged heavy rains. "Strong demands for military action to stop the Janjaweed militias"